← Sounding the T or not? One of my most delightful discoveries when I was looking for first quotations from eighteenth-century authors in the OED was that Fanny Burney was cited as the first user of ain’t. 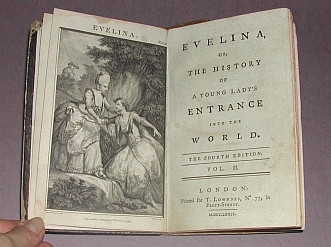 The source was Evelina, her first novel published in 1778, which contains much more non-standard language. I consequently reported this in my chapter called “English at the onset of the normative tradition” in Lynda Mugglestone’s book The Oxford History of English (OUP 2006). The book will soon be reissued as a second edition, so we were asked to correct any errors, and, in relation to the changes made to the OED since the time we did our research for the book, to update the text. To my utter disappointment, Fanny Burney is no longer quoted in the OED as the first user of ain’t. The reason for this change, according to John Simpson, chief editor of the OED, is that ain’t had been quoted from a late Victorian edition, and that upon checking this, it really was a’n’t instead. “Heyday, Madam,” cried the Captain, (prancing forward, with a look of great glee) “what, a’n’t you got out of that there passion yet? …”. 1845 W. G. Simms Wigwam & Cabin 1st Ser. 7 But you ain’t said,‥who was your Carolina gineral. 1785 J. O’Keeffe Peeping Tom of Coventry i. iii. 10 Now, ain’t I an old chaunter? 1667 A. Bailey Spightful Sister iii. i. 26 Look you, Sir, I an’t for complementical words; but here Stands the case. 1723 S. Centlivre Artifice ii. ii. 21 Oh gad! I an’t able to struggle any longer! So Fanny Burney may no longer be the recorded user of ain’t, but then she didn’t use ain’t in this form to begin with. For all that, it would be nice if we could find an earlier instance for ain’t, in this very spelling, than the one from O’Keeffe currently in the OED. Thanks to Lynda Mugglestone, John Simpson and Kate Wild for clarifying all this. Gallery | This entry was posted in usage features and tagged ain't, Fanny Burney, Merriam Webster, oed. Bookmark the permalink.